It was after Hurricane Irma on September 6, 2017, that the government headquarters housed at the Central Administrative Complex located in Road Town was destroyed leaving the frame standing, while some 75 percent of the physical files, chairs, desks and other office tools were also lost in the devastation, due to getting wet and scattered. The Administration Complex is one of the few government buildings that is insured with Nagico Insurance, and the policy is believed to be for $32M. After months of review, estimates and correspondence back and forth between the Smith-Administration and Nagico, the Government caved and settled for $11.4M. It remains unclear how much was the estimated claim cost put forward by the government for losses and damages. At one point, Government considered hiring a public adjuster to help with the efforts, but it is our understanding that this never materialised. “This was also a test of what most residents and businesses go through with their Insurance companies and if Government can’t get them handle how the ordinary resident will”, a senior civil servant told our newsroom. However, no date was given for the start of the works, as civil servants continue to work at the building with makeshift offices, wires exposed, no air condition in certain areas, makeshift wooden windows and barriers and openly exposed roofing. 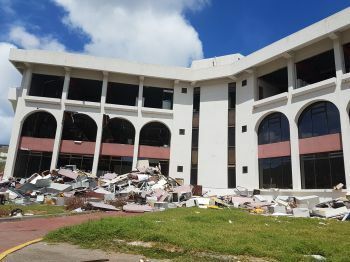 Premier Smith noted that “Significant damage was done to the buildings which house our public officers, therefore, several departments were displaced as a result of this. The receipt of this cheque is timely and will help to improve our infrastructure with greater resilience and enable more effective and efficient Public Service,” according to GIS Spokeswoman, Jacqueline Archibald-Sylvester. It is unclear also if the funds are enough to cover the cost of the building restoration. The landlord of the government Central administration Complex Permanent Secretary in the Ministry of Communications and Works, Anthony S. McMaster could not be reached for comments. This is a sell out! I thought S..... left the country! left his job? he aint crazy mehson. like you dont like sharn. what is your beef with him anyways? Totally agree they just like to bash Nagico without knowing the facts. 7.5 months for a poor settlement. Doesn’t leave much time to rebuild ready for the next hurricane season either. Come on people, Government wouldn’t have agreed to the claim if it wasn’t favorable. Its just over a month until hurricane season and with so long to receive a cheque, do you not think its possible they were forced in to making a rushed decision? "It remains unclear how much was the estimated claim cost put forward by the government for losses and damages". If the writer doesn't know how much was claimed then it is only speculation that the government "caved" and accepted a lesser sum. Poor journalism. Why didn't they mention the adjuster the government hired who will be walki g away with a percentage of that money. Too much half stories from Orlando, it's a shame what he is doingto this country! This story is false and is winding people up of false facts for political reasons . The story is making us believe that governments was beaten down by the insurance company but actually gives no fact or evidence to support this and further adds " we don't know if the funds are adequate to cover the repairs " . The sum paid out is the cost of the repairs directly caused by the hurricane so if you can't say if the figure is adequate or not you don't have a story . So what facts are in the story. Sum insured 32 mil paid out 11.4 mil. So based in that is a simple equation that 1/3 of the building was lost . I know the building and have been inside many times . I would estimate as a quick estimate about 1/4 building fabric damage at most . Yes it looks bad but the building frame and structure is still good it's electrical, glass and finishes with some M & E that needs replacement/ repair . So my gut reaction is they got a good settlement . My only concern is they gave them a cheque and did not insist repairs done which they fund because we all know that cheque is going to dwindle very very quickly on " other" stuff . It is in insurance companies DNA to be quick to collect and slow to payout, working over time not to pay out or reduce pay out. This is a broad brush statement but applicable to too many companies. Nonetheless, regulations must be put in place to narrow the gap between the consumer and insurance companies interest. A consumer protection agency and an insurance commissioner is a good start. What is not needed is another statutory body; there are enough/probably too many of these already. Some of them need to be dissolved and functions return to departments, ie, BVIHSA needs to under a Health Dept........etc. Ok. The Admin Building was insured for $32M but since the building was not a total loss, a $32M claim was not submitted. Was the $32M insurance policy at least 80% of replacement value (at least 80% of replacement value is needed to collect 100% on a partial lost). How much was the partial loss claim submitted? Why was the claim lowered, if so? Is the $11.4M enough to make the government/taxpayers whole? If no what is the actual repair cost and how will the delta be funded? Moreover, if the allegation is true, why among the tens of government buildings only the Central Admin Bldg was insured? By default, government was self insuring, assuming the financial risk, for the other buildings. Nonetheless, government clearly does not have and didn’t set aside the resources for self insurance. Consequently, going forward, government needs to transfer financial risk to a third party. We should not hate the players; hate the game. Government seem like they are good at squandering millions rather than negotiating in the best interest of the Territory. What a set of people. 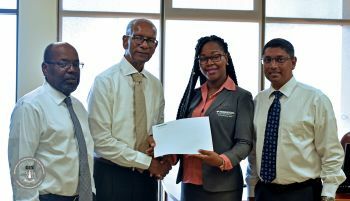 If the FSC invited complaints to be filed by dissatisfied insureds they would have ample evidence to withdraw the insurer's insurance license and expell them from the island. Those insurers that remain will be more than able to absorbe the business. Insurers are financial service provides and the FSC needs to demonstrate that they are regulating the insurance industry, which, clearly in this instance they are not. You clearly do not know him very well! I think the insurance pay outs have been a major issue after the storm but I also think it is reckless to report this story not having all the details of the claim. Poor BVI people why dont you all ask the question how much premium did our broke Government paid to get this policy? Thank you Nagico. How can you nay-saying bloggers make such critisisms when you have absolutely no idea how much was assessed and how much claimed. Obviously govt were not claiming for the whole building, the structure is still standing. Mind you, the way our contractors charge, and govt complies, I doubt if that will be enough to repair the place. I'm a bit curious, is it that Government lapsed on its policy and the insurance still tried to honour them? From 32 Mil in worth to 11.4 Mil as settlement. This is strange and then settling after 7 months. I feel Nagico is assisting the Government here. On the surface this would appear that they settled too low, but we need to ask what the conditions of their policy were. There have certainly been some poor dealing with insurance companies, but policies are black and white. There really aren't that many grey areas. This would suggest that the government may have negotiated a poor policy at the time of purchase. Depreciation is something that lots of people have lost money over and was in their policy when they purchased it, but they didn't take the time to read it. People have additionally taken significant losses through being under insured. When was the last time this building and its contents were appraised? If the government couldn't fight for more, the reason is generally that the terms they negotiated when they purchased the insurance were not in their favor. It's poor sales tactics on the part of the insurers but also equally (if not more) poor decision making on the government's part when buying the insurance. The insurance is for $32 mil according to the article which would be the replacement cost of the building. The building was not flattened so how can we say that $11mil is a mere amount, without knowing the quotes they got for repairs to the building? The Admin Building was insured for $32M yes but the building was not a total loss so why is there a need for the $32M payout? Maybe the damages were valued at $11M. We need to know the amount of the claim that was submitted before we pass any judgement, plus I don’t think our government would have accept if it was not fitting. I congratulate Nagico for the tremendous work they have been doing in order to help the recovery process. A wise man said, if you dont know what youre talking about, keep your mouth closed. You cannot have accurate news when you don’t get Nagico’s side on this matter. I’m not even sure if this is a “news site” as they claim it to be. And btw, some people who are commenting here act like they knew everything. Nagico spending money and not afraid to say so. Why the others quiet. Proof is in the information. It is ok not to like Nagico but there is no reason to try and discredit them for doing their job. Common sense will tell you that if this was not a fair settlement, it would have done quietly. I hope the contracts on this job go out for bid, Lord who am I kidding, At least make it look good, send the crumbs out for bid and keep the rest for the PARTY Construction TEam, Wink-Wink .